Pack your bags and travel towards the sun! I just found a great deal for you guys: For only 1728 DKK, you spend 7 days in Las Palmas, accomodation & flights included! This is possible through the separate booking of hotel and flights. The Hostal Kasa is only 3 minutes away from the beach and is located in the hirstoric centre of Las Palmas. You room offers a balcony and free WiFi. You have several shops, bars and restaurants right next to you. On Booking.com, the accomodation recieved a 7.7 out of 10 rating from 534 different reviews. In Las Palmas, you can visit the Museo Canario or Centro Atlántico de Arte Moderno. Take a walk in the Doramas or Santa Catalina Park or just enjoy the beach. There are dates available in September. You fly with Jet Time from Copenhagen to Las Palmas, hand luggage is already included in the price. Let’s go to the Gran Canaria deal! Sign up for our Newsletter, and don’t miss anymore deals. 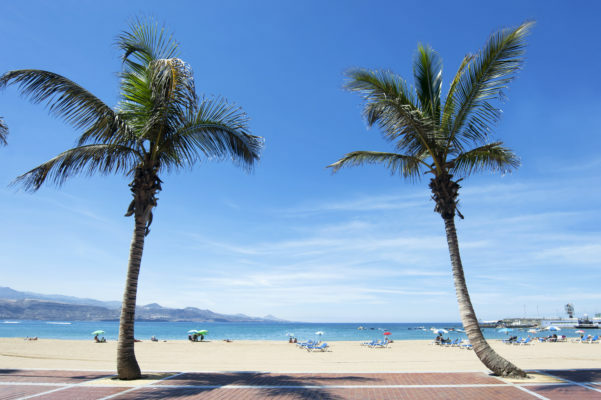 You’ll be the first to find out about our Gran Canaria bargains!